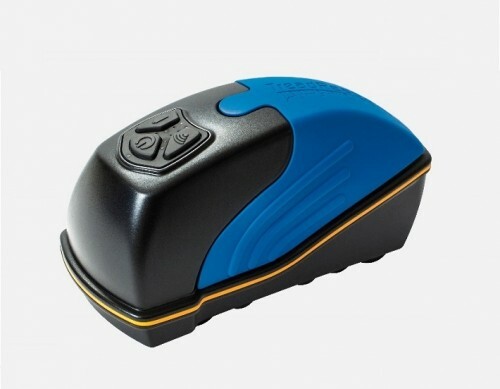 The TreadReaderTM Hand Held scanner is a compact and lightweight device. It is quick and easy to use and eliminates the errors associated with manual depth gauges. The scanner is positioned on one edge of a tyre and operated by sliding it across the tread face. Accurate tread depth readings for tyres of all vehicle types, such as passenger cars, LCVs, HGV, buses, and trailers, can reveal badly worn or unevenly worn tyres symptomatic of problems such as wheel misalignment or worn suspension. Colour coded 3D scans enable tyre replacement at the optimum time to maximise tyre safety and present revenue opportunities to the trade from increased tyre sales or service hours. TreadReaderTM is suitable for wet or dirty tyres and is ideal for all tyre inspection applications in workshops, service centres, inspection lanes, commercial vehicle yards and at the roadside. The calculated data can be imported into any fleet management system to log tyre scans and produce wear analysis or tyre lifetime modelling. The patented TreadReader tyre measurement technology creates a detailed 3D scan of each tyre, constructed from 320,000 measurement points, with an accuracy of < 0.2mm or 0.008”. By scanning the full width of the tyre and 50mm around the tyre, TreadreaderTM devices far surpass the accuracy and reliability of traditional dip gauges and non-contact ‘laser pointer’ measurement devices. Advanced software algorithms produce detailed colour coded 3-dimensional tyre tread images which show the condition of the tyre tread with absolute clarity. When presented to a vehicle owner, TreadReader scans immediately convey tyre condition and remove any perceived barriers to tyre replacement should tread depth be insufficient or illegal. 3D scans of the tyre tread using the TreadreaderTM Hand Held scanner can be viewed on a tablet, mobile phone or PC, alongside the calculated tread depths. The TreadreaderTM App for Andoid mobile devices is available to download, with simple steps to connect the mobile device with the scanner. Together, the App and scanner are an invaluable tyre inspection and diagnostic tool for all workshops and dealerships. The App connects easily to the scanner via Wi-Fi, with intuitive screens to guide technicians through the scanning of vehicle tyres. The App generates a Customer Report showing vehicle identification, 3D tyre scans with colour-coded tread warning and error alarms for every axle and tyre position.